Background: The evolution of distributed web-based applications and cloud computing has brought about the demand to store a large amount of big data in distributed databases. Such efficient systems offer excessive availability and scalability to users. The new type of database resolves many new challenges especially in large-scale and high concurrency applications which are not present in the relational database. NoSQL refers to non-relational databases that are different from the Relational Database Management System. 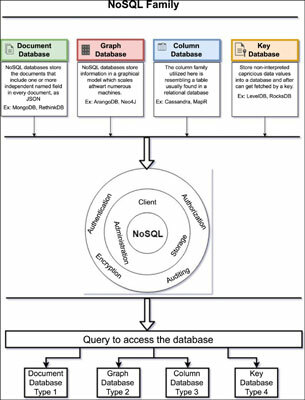 Objective: NoSQL has many features over traditional databases such as high scalability, distributed computing, lower cost, schema flexibility, semi or un-semi structural data and no complex relationship. Method: NoSQL databases are “BASE” Systems. The BASE (Basically Available, Soft state, Eventual consistency), formulates the CAP theorem the properties of which are used by BASE System. The distributed computer system cannot guarantee all of the following three properties at the same time that is consistency, availability and partition tolerance. Results: As progressively sharp big data is saved in NoSQL databases, it is essential to preserve higher security measures to ensure safe and trusted communication across the network. In this patent, we describe the security of NoSQL database against intruders which is growing rapidly. Conclusion: This patent also defines probably the most prominent NoSQL databases and describes their security aspects and problems. NoSQL, security, intruders, big data, authentication, big table.